Brain Circle UK is excited to host a compelling lecture by Professor Ami Citri, Head of the Citri laboratory at the Edmond & Lily Safra Center for Brain Sciences. 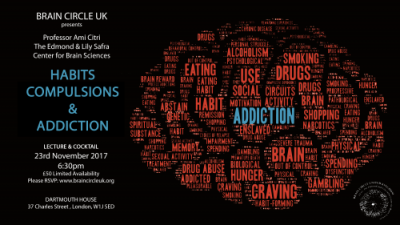 Dr. Ami Citri invites you to explore the exciting developments in neuroscience and how they pertain to the human disorders of addiction and compulsion. Drug addiction is the most prominent neuro-psychiatric disorder, with the greatest number of afflicted individuals and the largest cost to society. Other disorders include depression, anorexia nervosa, obsessive–compulsive disorder (OCD), chronic pain and schizophrenia. Within ten years, the Citri Lab hopes to make its mark on a range of neuro-psychiatric disorders by developing and sharing methodologies that will enable us to deepen our understanding of the molecular and neuronal circuits that form the basis for these disorders. at the Department of Natural Sciences. Dr. Citri has spent his academic career acquiring high level skills in the various cutting-edge investigative methods needed to implement an integrative approach to finding the roots of drug addiction. His research team strives to understand the basis of selective attention, as well as understanding the fundamental mechanisms whereby we encode memories and form preferences, habits, compulsions and addictions.